The year is 2010– the auspicious Oakland Athletics roster is infused with young talent, specifically a rotation flooded with burgeoning frontline starters. Gio Gonzalez, Trevor Cahill, and Brett Anderson all flashed immense potential as hurlers in their early 20s with All-Star caliber seasons, and Tyson Ross received his first cup-of-tea at the big league level. By the time the A’s punched their first ticket to October since 2006 a couple seasons later, none of them were featured as essential cogs in the rotation. Gonzalez and Cahill were shipped to Washington and Arizona, respectively, while Anderson recovered from Tommy John surgery, and Ross battled ineffectiveness that resulted in a minor league demotion. Fast forward eight seasons, and the time machine will return you to the present day. In 2018, the Athletics have shocked the baseball world by storming into contention out of nowhere. There’s a dearth of household names on the roster, with the possible exception being Khris Davis, who has all but shed his former nickname of “Khris Davis with a K.” Despite their lack of possessing celebrity profiles, budding corner infield stars Matt Chapman and Matt Olson have been among the lead contributors in the crew propelling the ship that’s inching closer to the Yankees for the top AL Wild Card spot. On the pitching side, there’s a few familiar faces behind the A’s success; things have come full circle for Cahill and Anderson in 2018. While Anderson has contributed to the team’s unexpected tear, this piece will focus on Cahill, the unheralded rotation leader in Earned Run Average, Fielding Independent Pitching, and K/9. Cahill has flourished in his second stint in with the A’s, pitching to a 3.12 ERA, supported by a strong 3.23 Fielding Independent Pitching (FIP). He’s built upon what he began to generate while pitching for the Padres last season, when he punched batters out at career-high rates, while cutting back on his previously appalling walk rates. In 2018, Cahill has advanced this progress, pitching to a career-high 3.26 K/BB rate out of the rotation. It’s scarce that such a well-traveled pitcher would see these kinds of drastic improvements in his true abilities at age 30, but this appears to be exactly what happened in the case of Trevor Cahill. The greatest distinguishing factor from the past few seasons to now has been Cahill’s mixing of pitches, likely a byproduct of the increasing role that analytical data plays in helping pitchers formulate their plan of attack. Trevor Cahill has become a journeyman since his original departure from Oakland, pitching for six different organizations in as many seasons before returning. Although he found decent success in his first couple campaigns with the D-Backs, and showed flashes of his former self in 11 GS for the Padres last season, this season has been one of reinvigoration for the 30-year-old right-hander. Cahill has been a tactician characterized by effective pitch selection this season, as he’s managed to utilize this essential element to dominate opposing hitters. Specifically, Cahill has found tremendous success against lefties by more frequently attacking them with his changeup— a pitch of which he’s mystically developed apt command and movement— that has been at the forefront of his rejuvenation. Cahill has experienced a renaissance in 2018, largely attributable to improved pitch selection. He’s been using his fading changeup as the most dominant pitch in his arsenal to stifle lefties. Cahill’s changeup has been elusive to left-handed hitters’ lumber this season, generating an incredible 43.4 % whiff rate; this is an incredible feat, especially given that he’s thrown his changeup more frequently (32.2 %) than any other offering against them. On the whole, his plan of attack against southpaws has deviated from previous seasons, as he’s reduced his dosage of sinkers (down 16.1 %) and curveballs (down 5.7 %). In addition to placing an increased emphasis on the usage of his nearly unhittable changeup, he’s upped the quantity of a new pitch in his arsenal, one that he first introduced last season. The true identity of the pitch is cloudy, as Fangraphs classifies it as a slider, while BaseballSavant claims it to be a cutter. Regardless, it has been a swing-and-miss generating weapon for Cahill, at a 35.4 % clip since last season. The scatter plot below shows the K-BB% and Fielding Independent Pitching for the 113 pitchers who’ve dealt at least 30 IP against left-handed hitters in 2018. With an elite 18.5 % K-BB% against LHH, Cahill well-positioned himself to post a 2.89 FIP in this sampling. 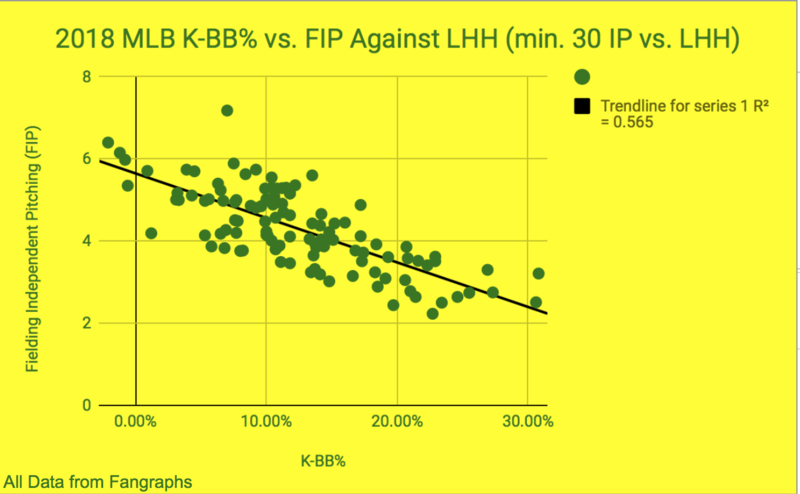 As you might expect, there’s decent, but imperfect correlation between a pitcher’s K-BB% and FIP; if someone is punching out hitters often and seldom permitting free passes, in addition to keeping the ball in the yard, that’s the recipe for sustainable success. Cahill’s strikeout rate of 27.4 % against LHH places him in close confines with some of the most elite arms in the game, such as Jacob deGrom and Luis Severino, two pitchers with blazing fastballs and nasty secondary offerings. Based on sheer stuff, Cahill’s arsenal doesn’t even belong in the same discussion with these Aces. The GIF below demonstrates the causation for opposing lefty hitters’ ineptitude at connecting with Cahill’s changeup. The victim here is Blue Jays OF Dwight Smith Jr, whose swing mechanics break down as the pitch initially looks like a good pitch for him to drive, before the ball dramatically darts out of the zone. Cahill’s changeup has exhibited such consistency in generating swings and misses against lefties this season that this pitch was just one of the hundreds of options of offerings that muddled opponents’ swings. According to Fangraphs’ Pitch Value Metrics, Cahill has thrown the 7th most valuable changeup in baseball (among SP to throw at least 70 IP), at +7.9 runs, placing him in the 96th percentile. However, his average of 7.3 inches of horizontal movement on the pitch registers only in the 47th percentile, an unexpected epiphany given the downright embarrassment it inflicts upon hopeless left-handed hitters. Regardless, the downward plummet of the pitch results in a nasty offering. There are many factors that contribute to the a dominant changeup, including deception, location, sequencing, and movement. Cahill boasts an arsenal conducive to the factor of deception, as it’s a daunting task for opposing hitters to differentiate between his sinker and changeup before their time has run out. Everything in Cahill’s arsenal works off the sinker, which he throws 36.8% of the time—more heavily against righties (41.4 %) than lefties (31.3 %). According to Fangraphs, the horizontal movement component on Cahill’s sinker is slightly more exaggerated than on the changeup, at -9.5 inches and -7.3 inches (tailing into a RHH’s hands), respectively, on average. The ultimate result is that hitters have a tough time deciphering between the two offerings before it’s too late to recover– delayed separation is created as his changeup plummets downward and the sinker attacks inward. The first GIF below exhibits the immense difficulty of figuring out what pitch is coming; Cahill’s 94 MPH sinker that sends Ronny Rodriguez packing flees the zone with a sharp, down-and-in zip that is destined to jam right-handed batters on their hands. This pitch is a quality offering in isolation, but coupled with the threat of pulling the tomfoolery in the second GIF that leaves Nick Castellanos looking ridiculous, hitters have been hopeless. The offerings look identical out of his hand, then there’s contrasting late movement that leaves hitters with little choice but to guess what’s coming. The successes of Cahill’s sinker and changeup are intertwined, as the two pitches play off of each other to leave opposing hitters dumbfounded. While the downward-diving changeup has been much more frequently used against lefties, its success has been more hyperbolized against right-handed batters. Cahill’s changeup has generated video game numbers (with the sliders set on Rookie, of course) against likewise-handed batters, with a .159 wOBA, backed up by an elite 213 xwOBA. The probability that a RHH batter would swing over his changeup has been nearly a coin flip, with the pitch inducing a monstrous 47 % whiff rate. Don’t get me wrong, Cahill’s changeup has been exceptional as the most frequently used pitch to stifle left-handed batters, but it’s actually engendered more dominant results to righties. Cahill has only thrown his changeup 20.8 % of the time to righties, while the other offerings in his arsenal have been clobbered for a combined .387 xwOBA. Cahill would likely fair even more favorably if he opted to increase his usage of the changeup in these situations, given the tremendous success he’s experienced with it. With the Athletics currently in possession of the 2nd AL Wild Card spot, and within striking distance of flagging down the Astros for the AL West crown, it’s safe to say that they’ve already exceeded the expectations set upon them before the season. However, this Oakland club is determined to finish with far more than the satisfaction of being in the pennant race: they want their season to culminate with the flaunting of the World Series trophy. As things stand, they’ll be taking on a headline-dominating, star-studded Yankees squad in a win-or-go-home atmosphere in the Bronx. On paper, the A’s don’t have a glaring runaway candidate to oppose Luis Severino, the likely recipient of the nod to start the game for New York. While Sean Manaea would’ve been the early favorite for the starting gig with his eye-opening showing out of the gates, Cahill has supplanted him as the leading candidate. Trevor Cahill has been overlooked for far too long this season; he’s garnered the results of a legitimate top-of-the-rotation arm all season long, and is showing no signs of slowing down. Yankees fans should beware: Cahill is just the kind of unheralded hero who could put the Bombers season to bed.